With colder weather soon arriving and energy prices constantly rising, now is a good time to consider investing in a new water heater. While water heaters do require a significant upfront cost, upgrading your old and outdated tank can save you in the long run in time, headaches, and energy costs. 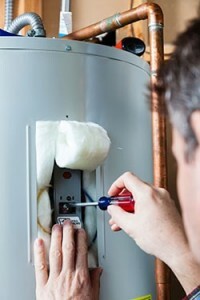 Choosing a new hot water heater is a big decision. When deciding on a water heater, your biggest decision will be whether to purchase a traditional or tankless model. There are pros and cons to each so let’s explore them now. Most homes in America are equipped with traditional water heaters. These feature a large tank with a capacity of 40-60 gallons. Water is heated by an electric coil and then the heated water is stored in the tank until needed. Because they are so common, they are easy to install and a variety of different available models allow you to shop at different price points which comes in significantly lower than tankless water heaters. However, despite their original cost-effectiveness, in the long run they are fairly inefficient. Heating the coils requires quite a bit of electricity so your bill will add up. They are also quite large and take up a fair amount of floor space. One of the largest complaints most folks have is that because the water is preheated and then stored in the tank, it’s prone to running out. If you have a large household with multiple people taking showers and dishwashers and washing machines running, a traditional water heater may not be able to meet your need. Tankless water heaters are much newer to the market and because competition has not yet driven the price down, they are quite a bit more of an investment than their traditional counterparts. However, many people believe their benefits far outweigh the initial sticker shock. These models heat water on demand so no storage tank is needed. They are mounted on a wall so they take up no floor space and they’re roughly the same size as the average electrical box. Because they heat water on demand they are far more energy efficient than traditional models since they don’t waste energy heating water you aren’t using. And because they heat on demand you never have to worry about running out of hot water. Which model you choose will depend on your budget, lifestyle, and preferences. Water heaters have a lifespan of 10-15 years so if you haven’t upgraded yours in awhile or if you bought an older house it may be worthwhile to consider having a new one installed. Your Silver Spring plumber can help you choose what’s right for you. This entry was posted on Friday, September 18th, 2015 at 5:02 pm. Both comments and pings are currently closed.